Spring time means more than just freshening up the home by doing our seasonal spring cleaning. It also means freshening up the home by touching up some rooms that may have become drab over the winter months throwing on a fresh coat of paint, adding some new throw pillows to our couches maybe and also adding some new wall decor to suit the new season. Artollo brings you elegant and modern art for any room in the home. Whether you are decorating your teens bedroom, creating a welcoming atmosphere in your living room or maybe decorating a new nursery, Artollo has something for you! Artollo was kind enough to send along a few samples of the artwork available for sale on their website. You can find many different things like wall decals, pillow covers and of course wall prints to frame in different styles and different artwork. It was a little hard deciding on which of the great prints I wanted! 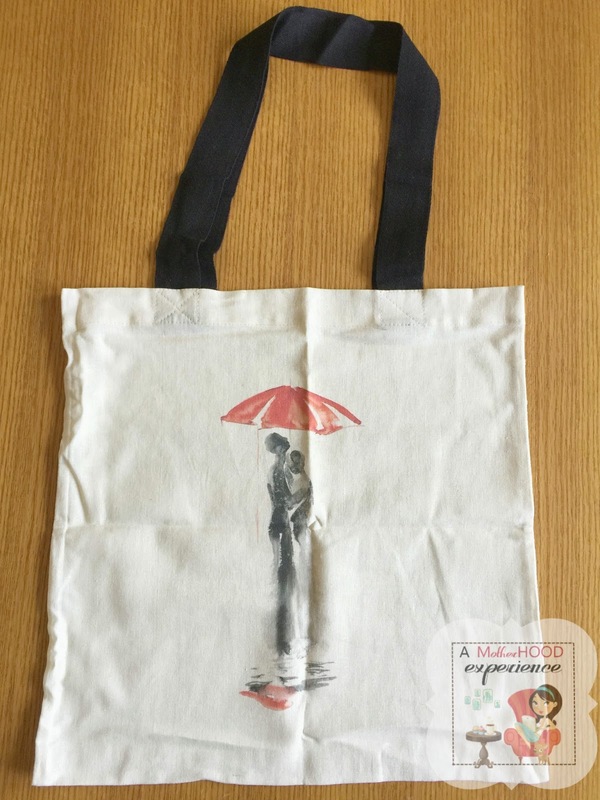 Tote bag - Under Umbrella print. I like collecting different tote bags, they're handy to have. From all the love related prints I can say that I really liked how this print draws emotion through simplicity. I thought it would make a great conversation piece on a tote bag. Tote bags come in different sizes and price ranges. The print looks great on the tote bag, I can't wait to use it on my next shopping adventure. 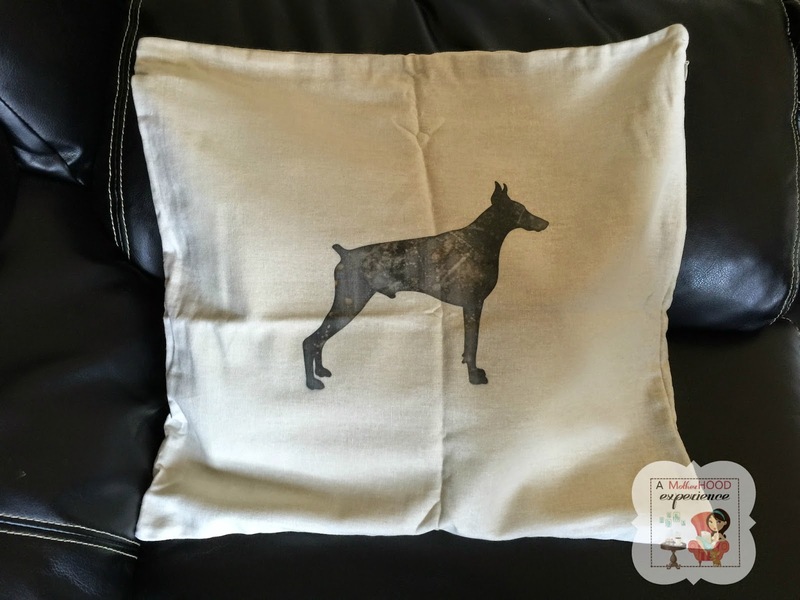 Throw pillow cover - Doberman print. Anyone who knows our family knows that our favourite large breed dog is the Doberman Pinscher. What more suiting in hubbys gaming room leather loveseat than a throw pillow cover with a Doberman on it! The print is a simple black silhouette of a male Doberman, no words and no other colour, I love it. Pillow covers come in different sizes and you can get them with other prints on them too. Right now our livingroom walls have canvas prints with different family quotes and phrases on them. On the way upstairs, we have a really big and really blank wall facing us as we go up or down. My idea is (once we paint) to put this beautiful Family Quote Wall Decal on that wall. It'll be a nice reminder and also add some modern to the stairway. I find the inspirational quotes and words humbling. Artollo offers different kinds of wall decals from quotes to bugs in different sizes depending on your style. Nursery Print Love is in the air. Although we don't have a nursery, we do have kids rooms and I thought this print would look great in the girls room. Again, I love the simplicity and the innocence in this print. The little girls hair blowing in the wind, it's pretty and reminds me of my daughters. There are so many great prints to choose from for baby and kids rooms. Prints come in various sizes as well depending on your decor preference. Overall I am happy to have been introduced to Artollo and the beautiful art they have to offer! You can find these and other beautiful art pieces at www.artollo.com! Posted on behalf of Artollo.com. Complimentary product provided as a thank you. Opinions and comments on this blog are those of the author. I love the Nursery print as well. I think it would look great anywhere! Thanks for sharing!